We set a new record with >65 participants in last week’s case voting. Unfortunately this will be our last COTW/COTG until we are back in action in early April. For all those who haven’t signed up for automatic distribution do it now by going to westernsono.ca and filling in your name and email address. This will be the last email reminder! Now let’s jump into the cases, the first one provided to us by Brad Rostas, Western Emergency Medicine resident and POCUS extraordinaire. The answers will be posted at the bottom of the post, but please vote on your answers before checking! What is your interpretation of this FAST exam? The patient was intubated, given 2 litres of IV fluids, and a foley catheter was inserted. Initial blood work shows: Hgb 128, WBCs 33, lactate 6, creatinine elevated at 180 and BHCG negative. The patient’s hemodynamics improved modestly but she remains hypotensive: HR 123bpm, BP 89/52. Vasopressors are being initiated. The remainder of the cardiac and thoracic POCUS was unremarkable. The resident on your service is using colour doppler to assess for mitral regurgitation in this patient with respiratory failure but can’t figure out which of the images obtained properly places the colour box. Can you help them out? Which of the above clips appropriately uses colour doppler to assess for MR in this patient? Better visualisation of mitral regurgitation, at the better window (PLAX). This week we are combining COTG with “Eye (s)Candy”, in honour of Katie Wiskar, our recent and to-be-returning CCUS fellow. A patient admitted with respiratory failure requiring intubation due to congestive heart failure had a history of atrial fibrillation. Due to his comorbidities he was both at high risk of stroke as well as major bleeding complications with anticoagulation. 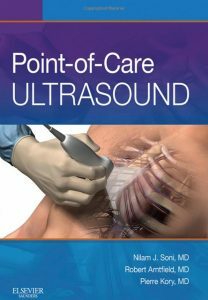 A POCUS TEE was performed to assess for left atrial appendage and help decide on anticoagulation while in the ICU. This POCUS TEE view is the midesophageal 2 chamber view which is obtained with ~90 degrees of omniplane angle and centering the LV in the image (may require counter-clockwise rotation of the probe). The left atrium is seen in the near field with the mitral valve and LV cavity seen in the mid and far fields. The left atrial appendage (LAA) is the half-crescent shaped cavity on the right side of the screen. The isoechoic “wavy” structure is thrombus sitting in the LAA. As a result of this POCUS TEE finding, this patient was anticoagulated. Presence of an intracardiac thrombus is a contraindication to left atrial appendage closure devices and so should not be pursued in this patient. Furthermore, the LAA closure devices are typically reserved for patients with unacceptably high risk of bleeding when on anticoagulation. LAA thrombi are the most common causes of cardioembolic events and are often associated with atrial fibrillation or atrial flutter. Low velocity flow in the LAA can be observed by the finding of spontaneous echo contrast (aka “smoke”), or “sludge”. We can also use pulsed-wave doppler to quantitatively assess the velocity of the blood in the LAA. The PWD gate should be placed at the ostium (opening) of the LAA. A very low velocity (<20cm/s) is associated with spontaneous echo contrast formation, LAA thrombus and increased risk of stroke in patients with atrial fibrillation. For question 1, the correct answer is D as complex free fluid is noted in all of the clips. The large anechoic area in the pelvis is the bladder filled with urine, which of course is not intra-peritoneal fluid. Answer C is incorrect because the complex fluid is not clearly delineated by bowel walls, and it appears to collect in potential spaces such as subdiaphragmatic, the splenorenal and pelvic areas of the peritoneum. It is perhaps most obvious in the second image (between the liver and diaphragm). The pelvic view shows a heterogeneous collection with the appearance of sludge, and hyperechoic “spots” suggestive of locules of air. Near the end of the clip, the large semicircular shape casting a hyperechoic artifact with posterior shadowing is also suspicious for extraluminal free air. In terms of the management, the most appropriate next steps would be antibiotics followed by urgent surgical consultation (question 2: answer A). Obtaining further imaging tests is unnecessary and would delay definitive treatment, thus it should not be pursued unless necessary for surgical planning. The composition of the free abdominal fluid cannot be determined by POCUS alone, although it’s complexity suggests bowel/gastric perforation. Requesting DPL, interventional radiology or lumbar puncture would all be inappropriate for this patient and delay exploratory laparotomy. Based on the results of this POCUS, the patient was brought urgently to the operating room where she was found to have a perforated gastric ulcer with significant spillage of gastric contents into the peritoneal cavity. A graham patch was done and the patient was transferred to the ICU for further management. The correct answer is E. A general rule for colour doppler imaging is that the colour box should be kept as narrow and short as possible, while still capturing the areas of interest. Answers A and F are much too large resulting in an uninterpretable mosaic of flows. Answer C, although small (which is ideal) does not capture the entire left atrium which is important to make sure we don’t miss part of the colour jet. In answer D, one might think that the box is appropriately narrow and captures both the aortic and mitral valves but the excessive height can limit the pulse repetition frequency (PRF) and thereby restrict the maximum possible Nyquist limits (i.e. maximum recordable velocity without development of aliasing). In this case the height of the box did not actually affect the Nyquist limit but it would if it were too excessive. This leaves us with answers B and E. Careful examination of the entire screen reveals that the velocity scale in answer B is only 26 which is significantly lower than desired for higher velocity flows we would expect from the high pressure LV to the low pressure LA. A simplified explanation of colour doppler is that it is a type of pulsed-wave doppler that interrogates a large area made up of thousands of little pulsed-wave gates in the colour box. Each little PW gate determes the velocity (speed and direction) of the blood in that certain spot. This information is translated into arbitrarily chosen colours to visually display the velocity information. The colour doppler scale on the upper left side of the screen is useful to remind oneself of the B.A.R.T. acronym (Blue flow is moving Away from the probe, Red flow is moving Towards the probe). It is important to remember that colour doppler is dependent on the alignment of the ultrasound beam and direction of blood flow; the more parallel the alignment the stronger the doppler difference and thus the more intense the colour doppler. The POCUS master, however, must understand some more advanced elements of colour doppler. Because colour doppler is a form of pulsed-wave doppler it is also limited by pulse repetition frequency, and the Nyquist limit and therefore prone to aliasing. Aliasing on colour doppler can be displayed as a mosaic of all colours mixed in with bright/white areas, or an area of “reversed flow” within a jet of the opposite colour. The size of the colour doppler box is of particular importance. The wider the box, the more scan lines and sample volumes are necessary which thereby lowers the frame rate and PRF. The longer and deeper the boxes location, the lower the PRF and Nyquist limit. Finally wall filters are used when assessing higher or lower velocities. Increasing the wall filter can be done when analyzing high velocity flows to reduce “noise” caused by low velocity signals. In the clips above the wall filter was unchanged in all of answers.